As the person controlling the finances of an organization, a treasurer role requires a strategic thinker with sound investment, financial reporting, regulatory, and taxation knowledge. With this in mind, your treasurer resume should showcase your ability to provide strict accounting controls and oversight. In the experience section of your treasurer resume, list not only your previous work experience in drafting financial summaries but also your ability to develop strategies for capital and risk management. 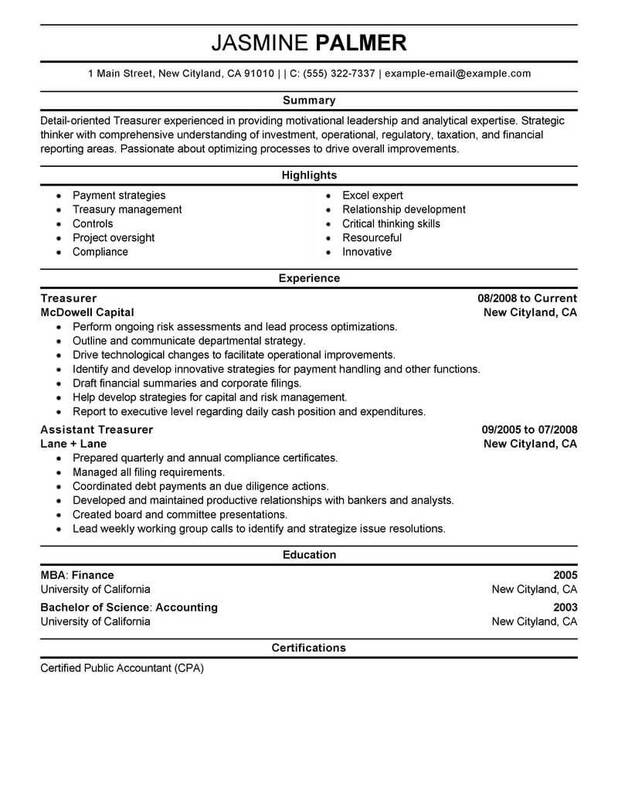 A master’s degree will set you apart from the rest, but you should also include your bachelor’s degree and note your Certified Public Accountant qualification as shown in the treasurer resume example. The treasurer of an organization is responsible for controlling the pursestrings and watching over all aspects of financial management. 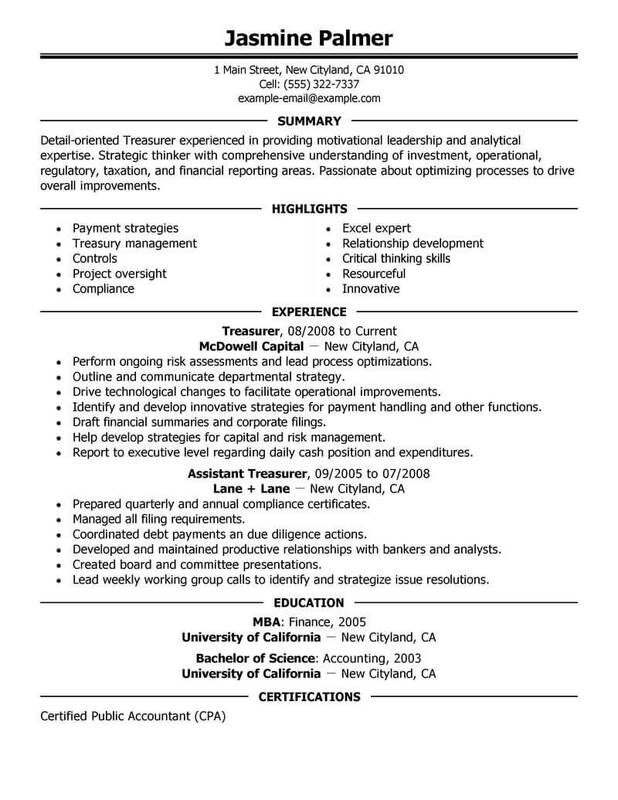 We’ve created the resume examples below specifically for treasurer positions. They’re designed to give you an idea of what a properly-written and formatted treasurer resume looks like, so it will be easier to create your own. Click on any of the templates to take a look, then create your own resume with these examples in mind. Here are 5 tips to help you navigate the job market as a treasurer. 1. Connect with industry professionals. The best way to find a job lead is from the inside. Speak with friends and colleagues in the region that can guide in you the right direction. Face to face connection often inspires people to help you more than an email or phone call, so make the effort to meet with people in person. 2. Branch out. Don’t restrict yourself to one industry. When economic times are tough, you want to diversify your range. Do your research and discover how your skills and training can be applied in other fields. This will greatly increase your employment options. 3. Be persistent. Don’t let any job leads fall by the wayside; follow up with each and every employer you meet. Employers look for initiative and tend to hire those who show more interest in a position. 4. Make a financial plan. The job hunt may take a while, so you will want to ensure your income remains steady during the process. Consider taking on temporary part-time work to keep money coming in while you look for more gainful employment. 5. Create an online profile. If in-person leads have dried up, then use the internet to expand your reach. There are hundreds of sites that will provide you access to job listings and career resources, as well as connect you with thousands of other jobseekers and industry professionals. 1. List only relevant information. Don’t include hobbies or interests, which can be viewed as frivolous. Your resume is reserved for you top professional accomplishments and experience; any other information is unnecessary and will likely hinder your efforts. 2. Keep it concise. Your resume should be 1 to 2 evenly filled pages. For instance, if you have one page plus some spillover, try to consolidate the document down to one page. Employers spend very little time reading resumes, so keep them brief. 3. List your most recent positions first. Your job history should go, top to bottom, from most recent to least. If you feel some experience is irrelevant to the job you are applying for, then feel free to omit it. 4. Keep it straightforward. 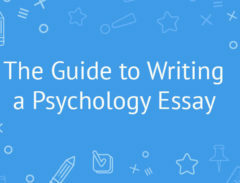 Avoid using too many headings or subheadings. 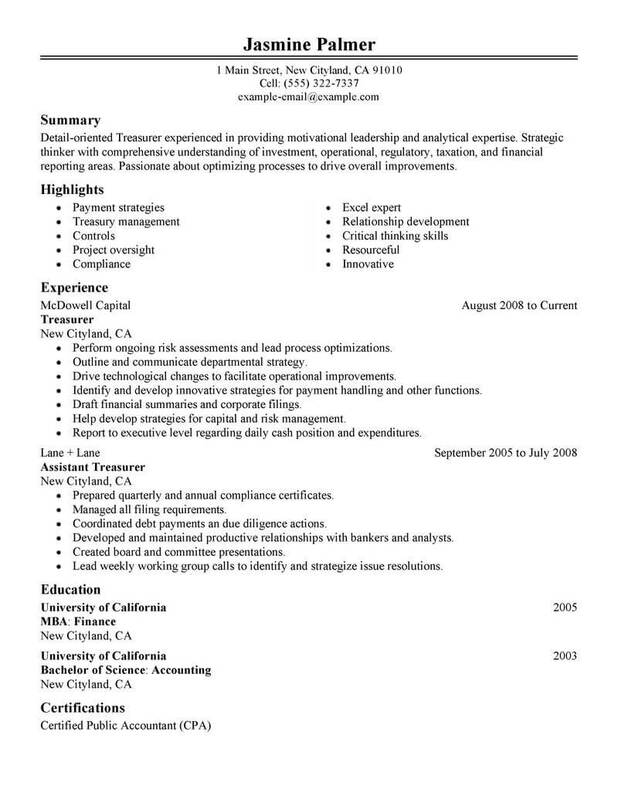 A streamlined resume is the most effective. Keep your categories simple: education, experience and skills. 5. Check for mistakes. Spelling errors don’t look good on your resume. Proofreading takes very little effort and should always be performed before submitting a resume to an employer.